I think this recipe doesn't need much introduction. This is popular in Malabar region. People from other regions of Kerala are also familiar with this dish. 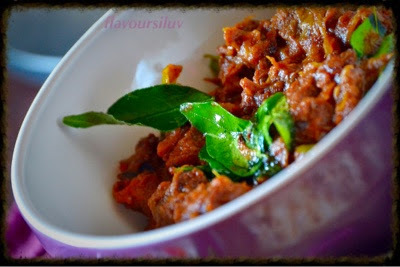 BEEF VARATTIYATHU is always a big hit at our home. Whenever I made this for my guests, they loved this and finished it off. I made this for a Friday feast along with Jaipuri Pulao and Raita. If you used to make beef in another style, then definitely tryout my version. Firstly mix together washed and drained beef with 1/2 tbsp ginger-garlic paste, 1/2 tsp turmeric powder, 1 tsp chilly powder, 1 tbsp coriander powder, whole pepper and salt. Pressure cook the beef by adding little water. Do not add more water. 1/4 cup of water is enough to cook the beef. Cook for 15-20 minutes until the beef cubes are done. In an earthen pot (Munchatti), heat 2 tbsp of coconut oil and add fenugreek seeds. When it browns, add fennel seeds. When it starts to crackle, add sliced onion and saute till it becomes transparent. Add remaining ginger-garlic paste and saute till the raw smell goes. Now add green chillies followed by remaining chilli powder, coriander powder and turmeric powder. Saute in low flame and take care not to burn the masala powders. Add chopped tomatoes, saute till it become mushy. Now add cooked beef with the water, mixwell and cook for 8-10 minutes covered. Open the lid and add pepper powder, garam masala powder and stir well. In a small pan, heat remaining coconut oil and add chopped shallots. When shallots turns brown, add curry leaves and pour this to the beef gravy. Beef varattiyathu is now ready to serve. 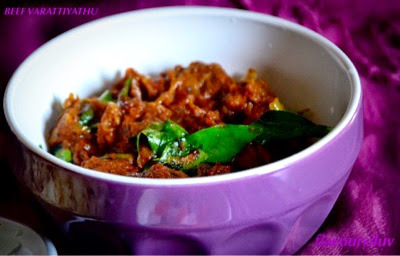 The beef varattiyathu looks yumm .I donot add fenugreek will try that next time. ooh yumm I would definitely try this ! !